Almost three years ago I started painting over all the beige walls in our home and my choice was Gray Owl because it was a light gray with a hint of green/blue in it. I can’t believe how much this room has changed in the past few years. It seems so small in this pic and really the leather furniture was too big for this room, this was not long after we moved in. 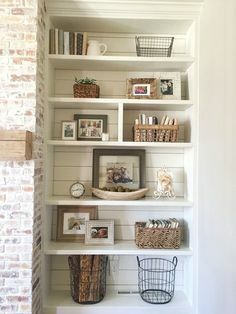 I loved this inspiration from For The Love of a House. And I still love it today! The white, the marble, the flooring, the gold, the greenery, all so good together and it doesn’t feel cold to me at all with all the white and gray. 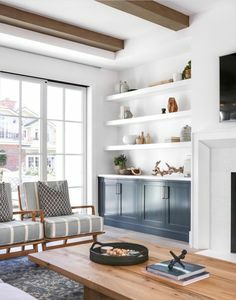 Such a beautiful kitchen and really, go check out the rest of their house too, it’s amazing! Now that the kitchen cabinets are all white, I feel a sense of freedom and not being tied down to certain paint colors anymore yet I still love my gray owl. The problem is, I ran out of the original can of paint. 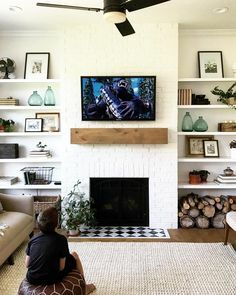 The paint from the same store doesn’t match the wall color so when I painted over the patch job we did where the tv used to be mounted on the wall, it’s noticeably different. Honestly, with four kids and two dogs, the walls are also in need of a paint job. I’ve scrubbed them down plenty of times but it’s really just in need of a fresh coat of paint. These photos were taken on a cloudy, gloomy day so not as bright as it usually is in my kitchen/living room area. So now, do I redo the Gray Owl or try something else? If we decide to stay here, our plan is eventually to replace the flooring in the kitchen and living room, replace the counter tops, add a subway tile back splash, redo the tile around the fireplace, replace the ceiling fan, scrape off the yucky popcorn ceiling while the flooring is being ripped out, build some built ins around the fireplace and call it a day! So if you happen to have $10,000 laying around, give us a call! 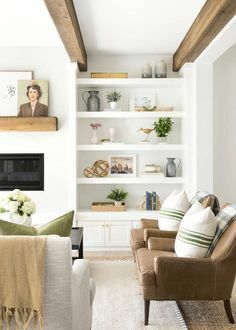 I’ve noticed on my kitchen and living room pin boards that I am drawn to very light/neutral walls with pops of color from accessories. Having SAD (undiagnosed) and living in Minnesota, I need my house to be light and bright! So I don’t think I’ll be painting my walls anything colorful or even dark anytime soon. 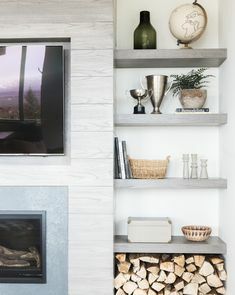 Plus, I just love the way I can change things up in a room when the walls are neutral. 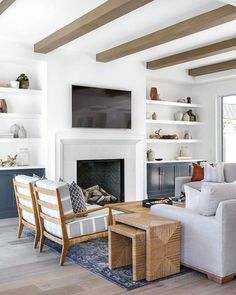 If you have a favorite neutral wall color, I’d love to hear about it and even better yet, if you have it in your home, leave the link so I can check it out! Did I mention I have NOTHING on my calendar this week during the week and I LOVE it! I worked so hard to finish up Christmas shopping last week, did the Christmas card last night, now it’s time for me to ENJOY this week, soak it in and not feel stressed out! I hope you can enjoy sometime in the next few weeks to soak in the reality of Christmas, Christ coming to us as a babe, born to die for you and me. A love so great, we have a hard time comprehending it. Unlike Santa who’s decision to give gifts is based on your behavior, Jesus wants to give the gift of eternal life because he knows we aren’t deserving of his gift. He loves us and it is not dependent on our behavior, it is a true gift, one that we do not deserve and one we can not earn. If you have any questions about Christ and his gift of salvation, please message me friends! I would love to share with you. If you are looking for more to read this season, She Reads Truth has a wonderful Advent series you can check out! I’ll be back later this week! Have a wonderful Monday friends!